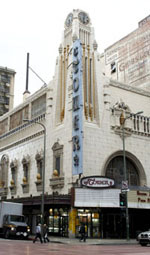 The Broadway Theatre Group was established to preserve several of the great movie palaces built in Downtown Los Angeles during the early 20th century and restore them to their original beauty and grandeur, while making them available as viable, versatile and unique venues for the performing artists and cultural events of today. 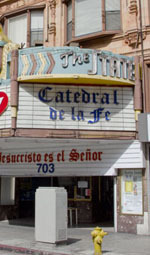 Millions of dollars have been invested in restoring the architectural and interior design of these theatres. In places where the original design elements were too badly damaged to restore, highly skilled artists and artisans were employed to reconstruct those elements as faithfully as possible. At the same time, modern lighting, truss and electrical systems have been installed to accomodate the needs of today's performers. Restoring and re-activating these theatres has been a major catalyst in the revitalization of the Broadway District, in tandem with the City of Los Angeles's Bringing Back Broadway initiative, led by City Councilmember José Huizar. 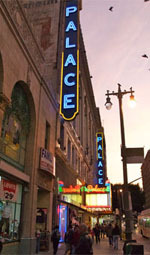 Three of the theatres in the Broadway Theatre Group—the Los Angeles, the Palace and the Tower—are currently available for live performances, film screenings and cultural events. The theatres in the Broadway Theatre Group have also been used extensively as locations for feature films (The Dark Knight Rises, The Artist, Hitchcock, The Prestige, The Big Lebowski, The Mambo Kings), TV shows, commercials, music videos, magazine photography shoots and more. To book the theatres for an event, contact Event Programming at events@btgla.com or by phone at 213-488-2009. 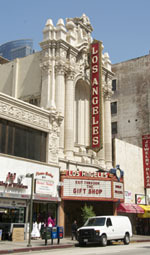 Arrange a site visit today by contacting Manager Ed Baney at manager@losangelestheatre.com, or phone (213) 629-2939.